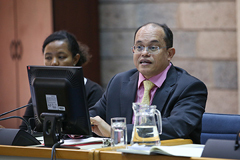 On 15-19 February 2016, delegates from 114 Member States and 42 major groups and stakeholders participated in the second meeting of the open-ended Committee of Permanent Representatives (OECPR-2) at UNEP’s Nairobi headquarters to prepare for the second United Nations Environment Assembly (UNEA-2) in May, the world’s highest-level decision-making body on the environment. During the week, delegates actively prepared resolutions and decisions, which were grouped in five issues clusters, and would be recommended for adoption UNEA-2. The BRS Secretariat took part in OECPR-2 as an observer and provided information on decisions and ongoing work under the Conventions that were relevant to the meeting’s deliberations. At the invitation of UNEP, the BRS Secretariat made a special briefing to the delegates engaged in the working group’s discussions pertaining chemicals and wastes management. The briefing aimed at highlighting the importance of the sound management of chemicals and wastes for the achievement of the 2030 sustainable development agenda. It also presented ongoing efforts undertaken by partners to implement the chemicals and wastes part of the sustainable development agenda. These information materials have been developed by the Secretariat of the Basel, Rotterdam and Stockholm conventions, in cooperation with UNEP Chemicals and Waste Branch, including the interim secretariat of the Minamata Convention on Mercury and the secretariat of the Strategic Approach to International Chemicals Management.